Experience the innovative thrills of Universal’s Islands of Adventure®! Here you’ll journey through five uniquely themed islands – Seuss Landing, The Lost Continent, Jurassic Park, Toon Lagoon and Marvel Super Hero Island. From the Incredible Hulk Coaster to the Jurassic Park River Adventure to The Amazing Adventures of Spider-Man, the world’s most cutting-edge rides, shows and interactive attractions challenge all your senses! Islands of Adventure also hosts a variety of annual events, including Grinchmas, where the classic Dr. Seuss story of the Grinch comes to life with events such as the Whoville Whobilation musical show, tree-lighting ceremony and much more. We know you will enjoy your visist to Islands of Adventure in Orlando Florida. You’ll need 3-D glasses for this ride as you follow Spider-Man on a fun adventure high above the city. You’ll see, hear and feel all of the action! at Islands of Adventure in Orlando Florida. Ride through the pages of this childhood storybook as The Cat in the Hat and his two friends – Thing One™ and Thing Two™ – try to bring down the house! at Islands of Adventure in Orlando Florida. Experience Dr. Bruce Banner’s rage as you soar to the sky from zero to 40 mph in two seconds flat! This high-speed roller coaster will definitely make you scream! at Islands of Adventure in Orlando Florida. This ride is not for the fearful as you rocket 150 feet up in the air and then hurl back down to Earth just as fast as you went up. at Islands of Adventure in Orlando Florida. 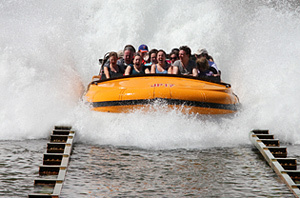 Get ready to get soaked as you plummet down Ripsaw Falls on this exciting water ride! at Islands of Adventure in Orlando Florida. Soar 125 feet in the air and reach speeds of 55 mph in the world’s first inverted, dueling roller coasters. at Islands of Adventure in Orlando Florida. See Sinbad and his sidekick Kabob rescue the Princess Amoura from the evil witch Miseria in this exciting live adventure! at Islands of Adventure in Orlando Florida. Plunge 85 feet into darkness, in this unforgettable river raft ride, as you escape a hungry T-Rex. at Islands of Adventure in Orlando Florida. Learn about the fascinating world of dinosaurs and Earth’s prehistoric era via hands-on exhibits, games and much more! at Islands of Adventure in Orlando Florida. Brave whitewater rapids as you help Popeye™ save Olive Oyl™ from the evil Bluto™! at Islands of Adventure in Orlando Florida. Held from late November through early January, Grinchmas brings the classic Dr. Seuss story to life with events that include the Whoville Whobilation musical show, tree-lighting ceremony and much more. at Islands of Adventure in Orlando Florida. Not for the squeamish, Halloween Horror Nights promises an intense night of thrills and chills. Events at Halloween Horror Nights include haunted houses and mazes, scare zones, a Halloween parade, specially themed shows and live music, as well as an assortment of wandering ghouls, zombies, demons, werewolves, ghosts, goblins and vampires. Halloween Horror Nights takes place throughout the month of October. at Islands of Adventure in Orlando Florida.